Highschool life...What can I say? This is US in our gala uniform. If I remember it right, we would wear this once a month and also during feastdays or any kind of church celebrations. By the way, I went to a Catholic school, St. Nicholas Academy. I am the shortest gal, 3rd from the right, if you still haven't recognized me. Two of these pretty ladies, 1st from the right Charlit and 4th from the left Jeany were there at my Philippine Church wedding last January. The rest are now living in the U.S., Singapore, Canada and Dubai. It's me again with some of my lovely classmates in our blue uniform which is the school's regular uniform. I am the one in that unhappy looking pose, hehe, first seat from the left. I miss highschool. I'm glad I have these photos to remind me of those days. How about you? Do you still have some of your old highschool photos? How do you look back then? Does it make you feel ancient when you take a look at them now? gamaya pa gud nimo sauna net no? 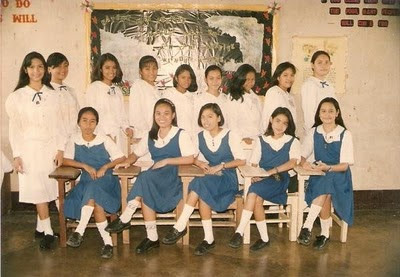 hehe pareho jud ta..
isn't it nice to reminisce high school life? sigh! 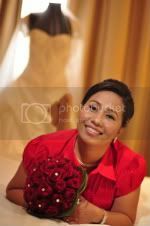 Hahaha Jenn dear nalingaw ko sa mga pics nimo. parehas diay ta Jenn, short hehehe pero naa pay mas short nako hehehe... So nice baya maka gala uniform kay neat kaayo tan awon. I was wondering, do most high schools require uniforms there? Or is it just for private schools? The uniforms are cute. Makes the girls look so sophisticated and demure. HAhaha! Wa jud ta ka na-recognize, Jenn. Pero you're still the same Jenn back then and now- stunning beauty. Shortest? Kung kaw ang shortest, unsaon nalang ko? LOL! It's a good thing you've got these lovely captures to reminisce and look back. Indeed, high school life are beyond compare. I had my fair share of all the wonderful experiences in high school. Our class valedictorian (we were 968 graduates, yep big national high school!!!) was my boyfriend and oh... puppy love! LOL We used to be the most sikats in our school, but gone are the days na! Akong na-bana karon kay valedictorian japon sa high school nila pero 2 ra ka sections. Bukid pa jud. Hahaha. Jen, I also like looking back at high school photos ...it reminds me of the innocent, youthful carefree days we had....malingaw jud ko ug tan-aw. Yes I still have some of them...ang uban nangawala na, but at least I've saved some and grabbed some from Facebook friends. hehe! 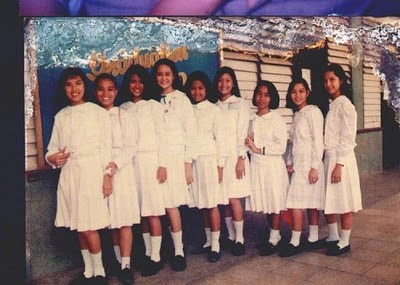 same ta ka kapayat tong HS..ka nice sa Uniform ninyo oi..
About AI, maau wala na tanggal c Andrew GArcia..tuloy ang laban nya..ang wife nya nga pinay kuyaw kaau hair oi..skinhead sa both side then ang hair tua sa tunga murag chokoy gani. -i was only the 2nd smallest in our batch, however, she was not close to our group so whenever we have group photos with my close friends, it's always me who's the shortest, lol. -haha. daghan nata hazie. common cguro ning heighta sah, hahah! yeah gala uniform is neat pero dali lang mahugaw. dili ko nahan musol ob ani before. -hehe, thanks bchai! i don't know how to smile during picture taking back then, i was so shy and no confidence at all so i always have this smirk look on my face coz i don't know how to smile, hehe. -lains, haha naglisod diay ka ug recognize nako ha. o jud shortest jud kaha ko even until now nisamot labi na hir sa US. tag-as pa nako ang mga 12 yr old kids diri, waaaahhhh! -yep, thanks to my friends and classmates back in HS and also to Facebook too. :) glad to hear you're doing better now. get well soon my friend! -hahah katawa man ko nimo anne oi. cge lang short ka sauna at least inyo prince charming na-attract diay nimo. :) wow those were the days. -im not surprised that you were sikat back then and being the girlfriend of your class valedictorian coz until now you're still pretty. :) mao jud sah, nice jud mag reminisce sa atong nakaraan, hehe. -that's right, nice jud kaau mag reminisce sa atong higshchool life. :) wla na kaau ko picture from HS dhu good thing akong mga classmates sauna naa sila tyaga kaau mag upload sa facebook. High school is one of the most memorable moments of my life too. And thanks to facebook, old photos have resurfaced, I also have a good laugh seeing my old class pictures.